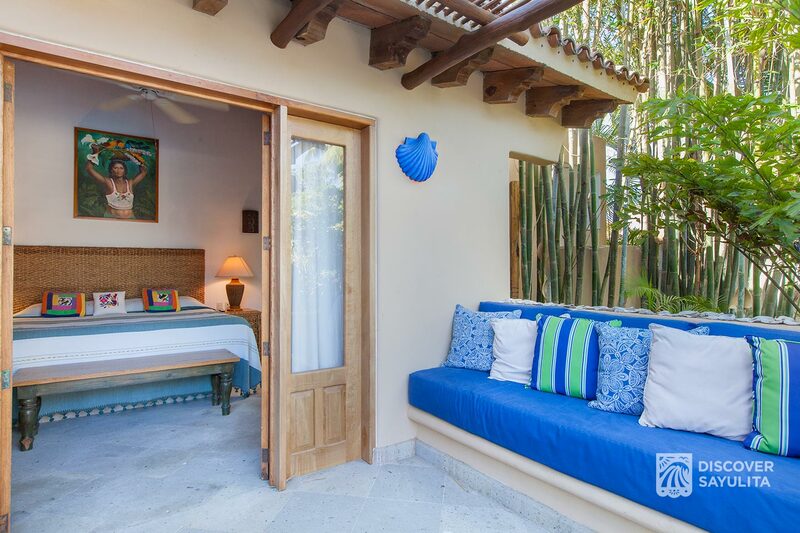 Located just 1 block from the beach, the newly built Casa Azul’s 3 bedroom, 1 bonus room and 4 bathroom design is an elegant spot for your Sayulita vacation. 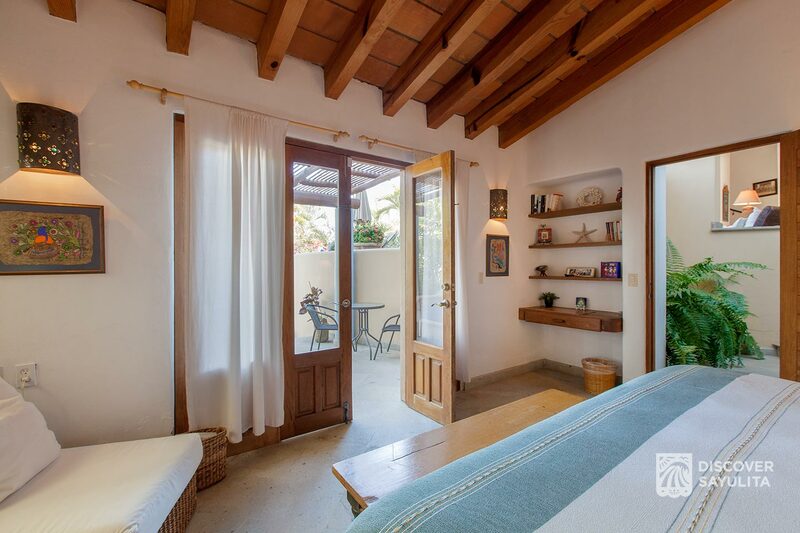 Located just 1 block from the beach, you are close enough to town (5 minute minute walk), yet its northern location provides quiet and peaceful surroundings. 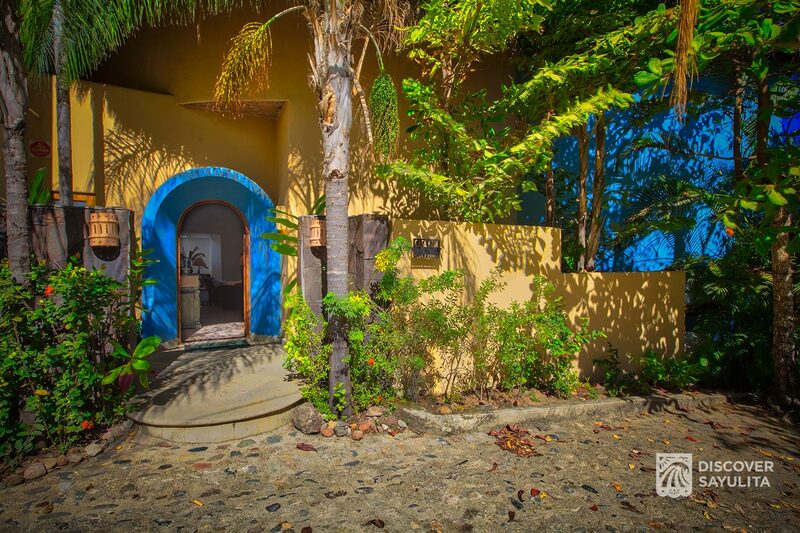 As you enter the home, Casa Azul’s open and brightly lit dining and living area provides a warm and inviting area for family, friends and great times. 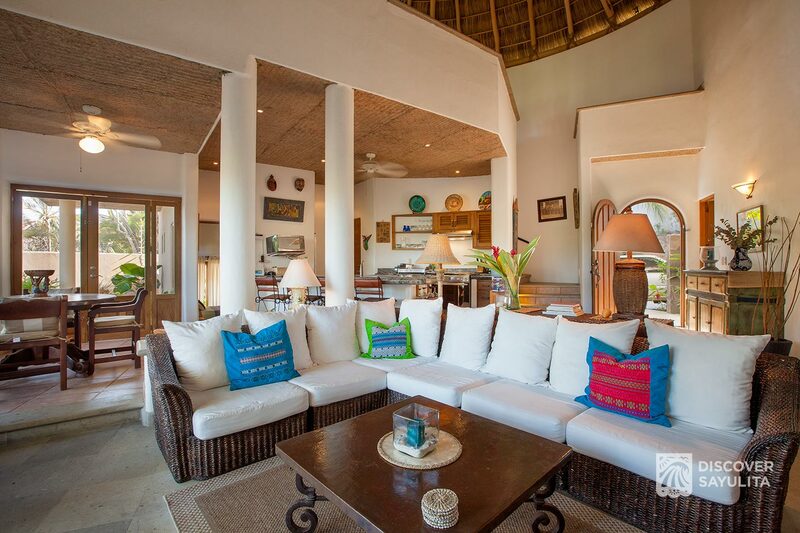 Adorned with a traditional, Mexican style palapa roof, the main house has plenty of comfortable seating for entertaining, games, parties and family time. 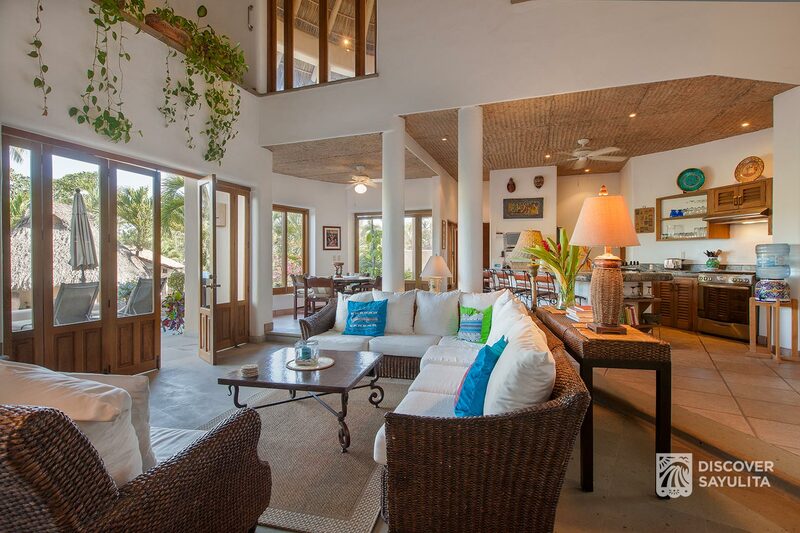 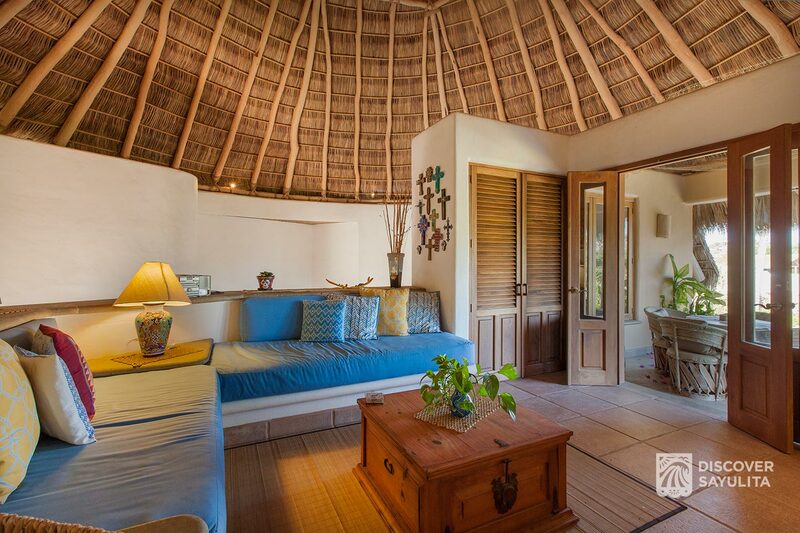 The living area’s, traditional wooden doors open to let in cool breezes and the year round sounds of the tropics. 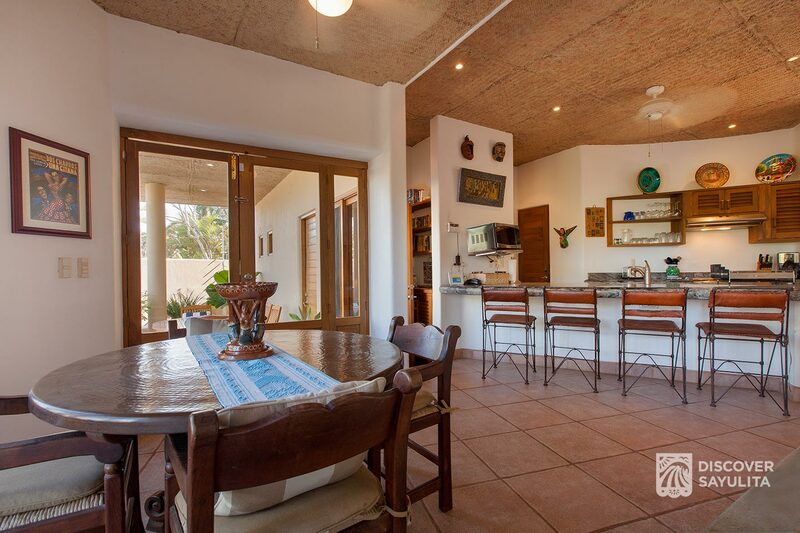 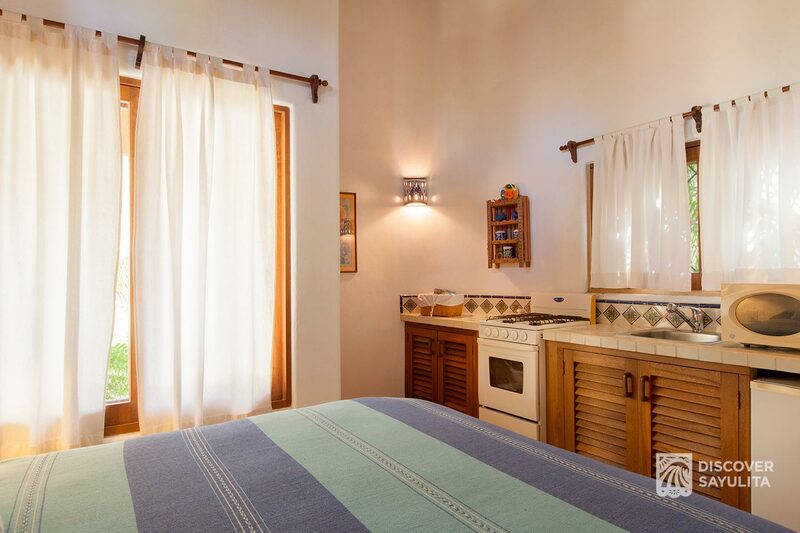 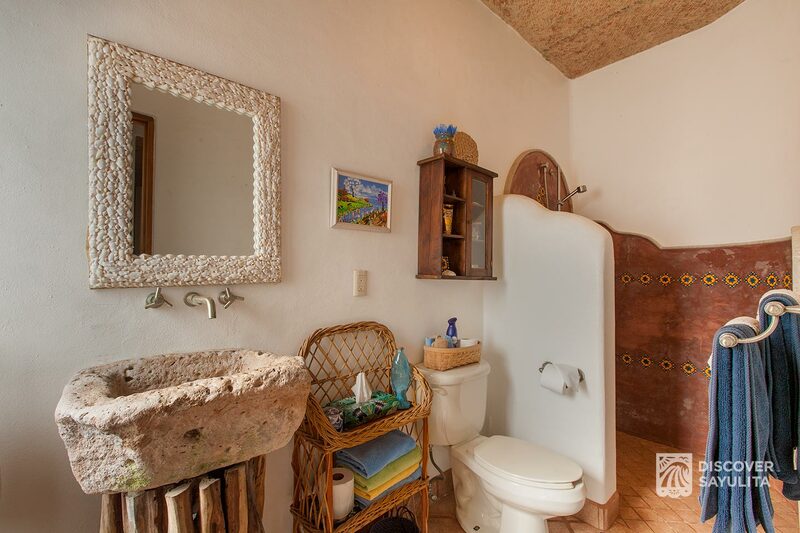 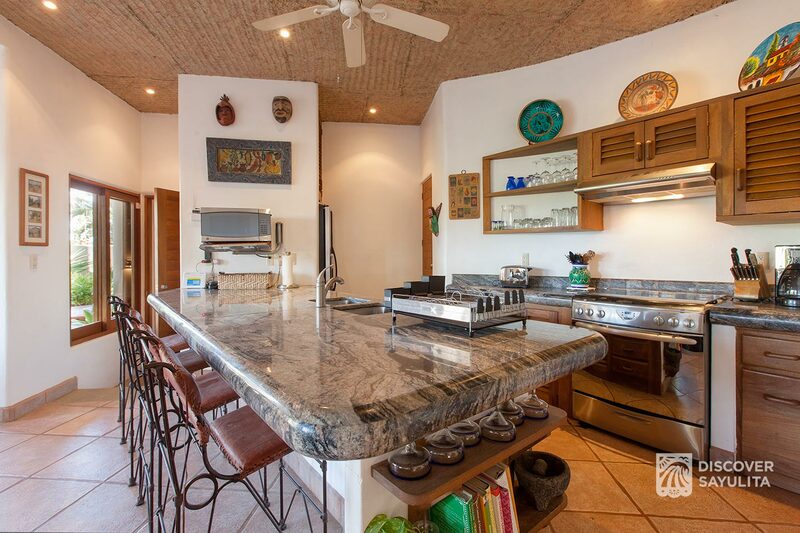 If you get tired of Sayulita’s diverse and many places to eat, Casa Azul’s fully equipped kitchen has all the modern conveniences of back home including; filtered water, a dishwasher, an ice machine on the refrigerator and much more. 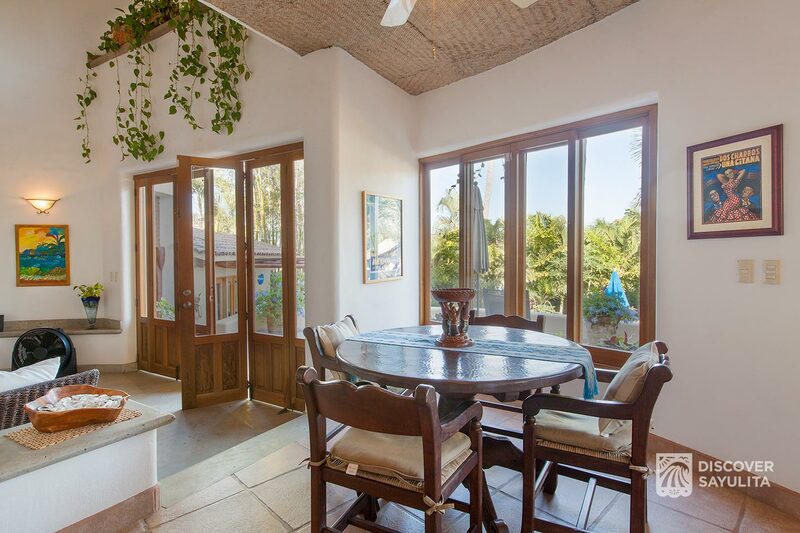 Drink your morning coffee or catch up on conversation with the ample amount of kitchen bar area seating. 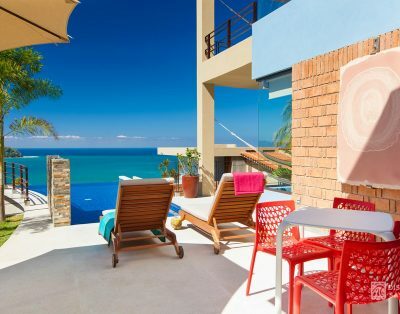 The views from Casa Azul’s many balconies are absolutely stunning. 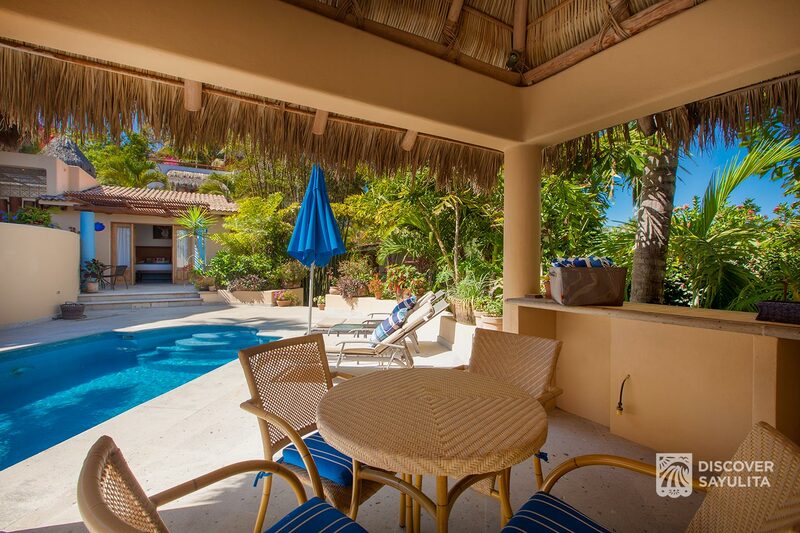 You are surrounded by ocean views, palm trees and lush vegetation. 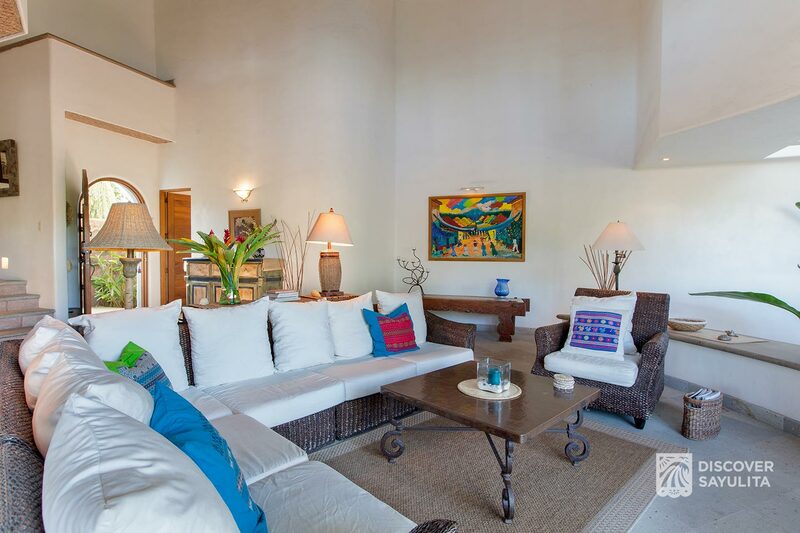 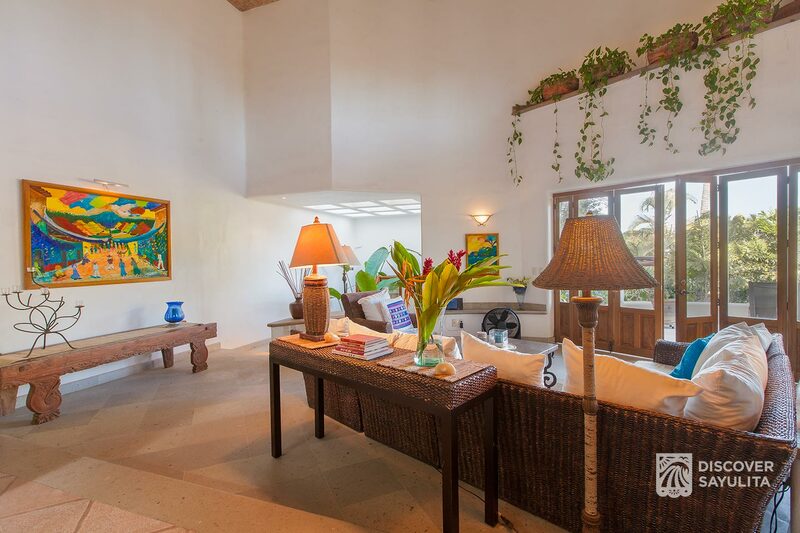 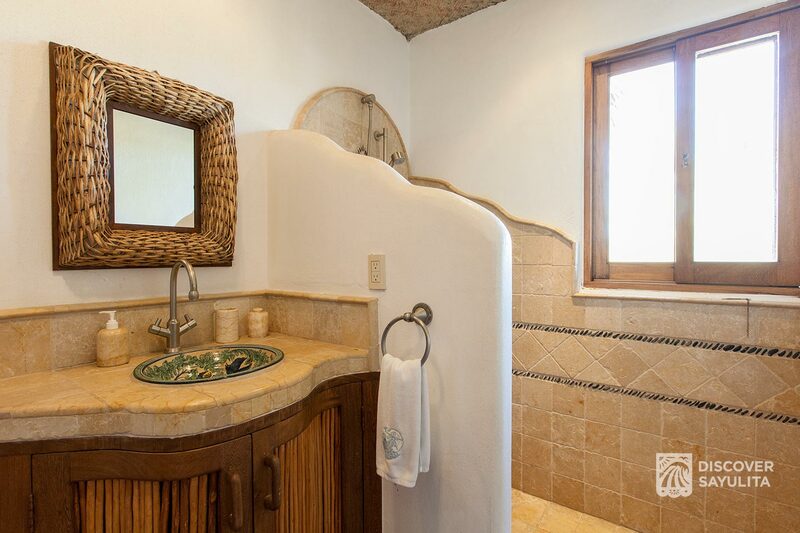 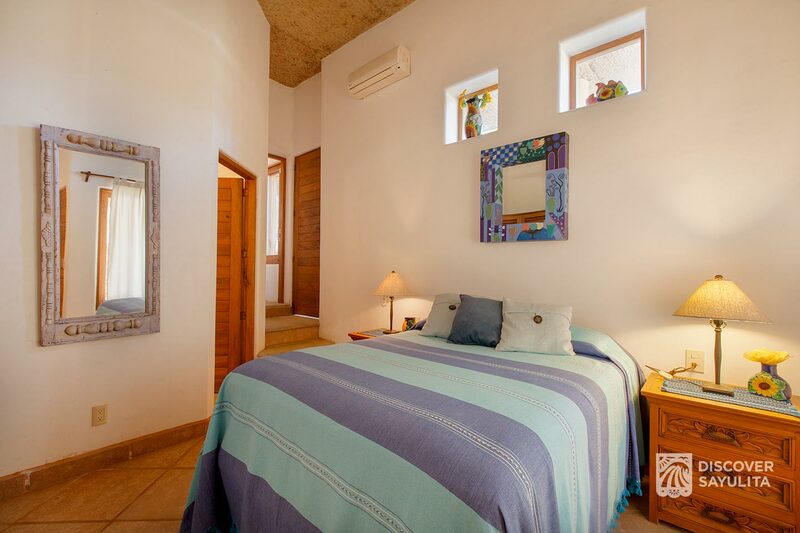 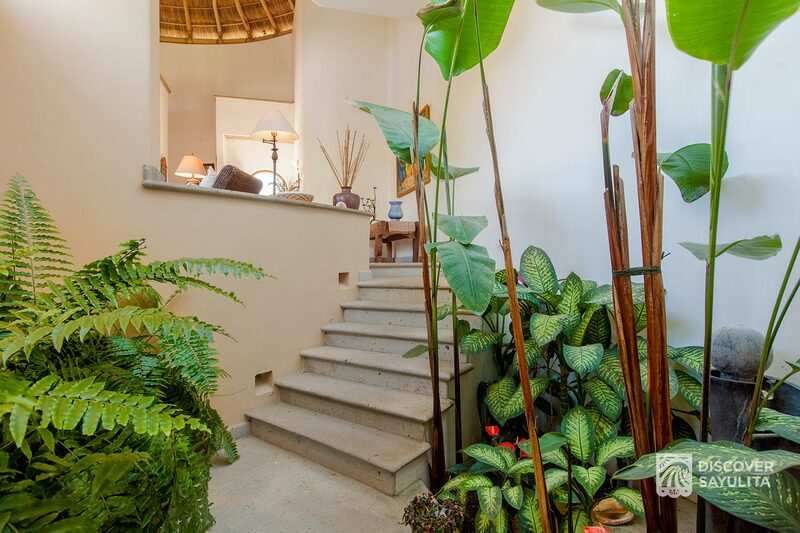 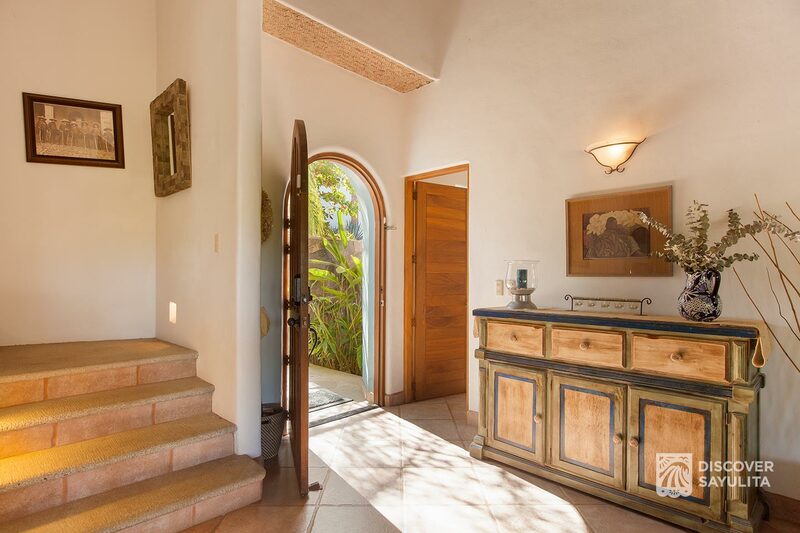 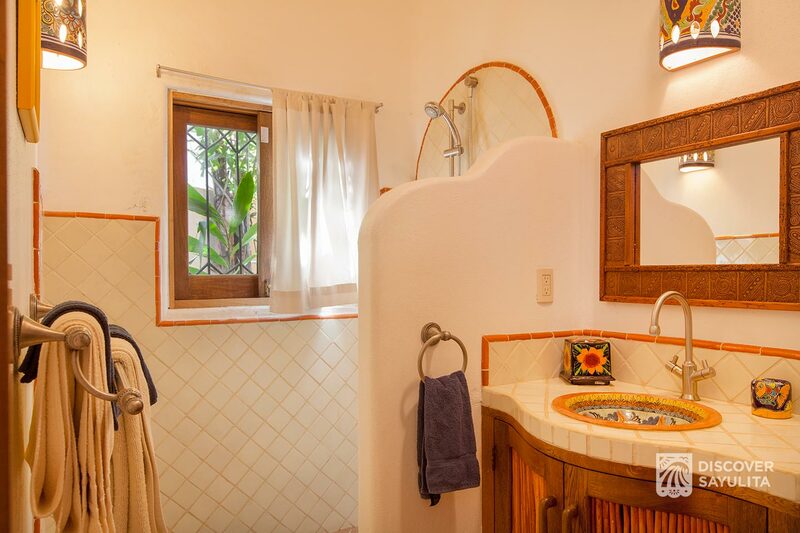 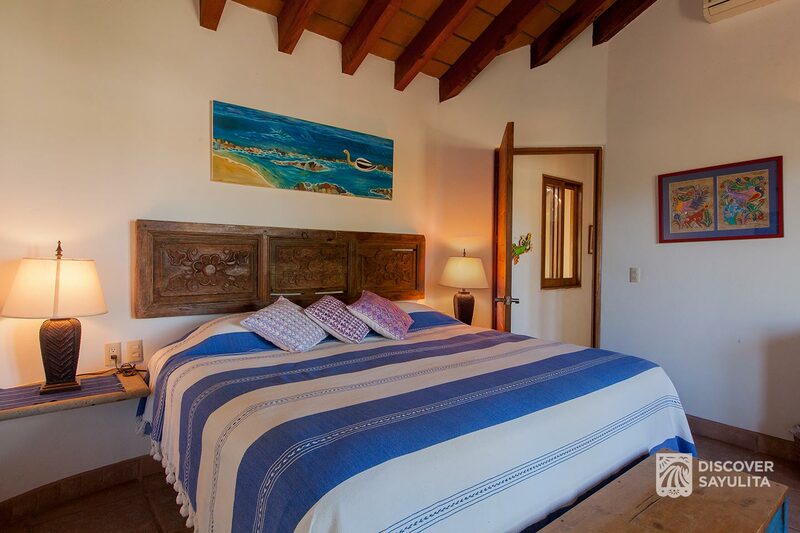 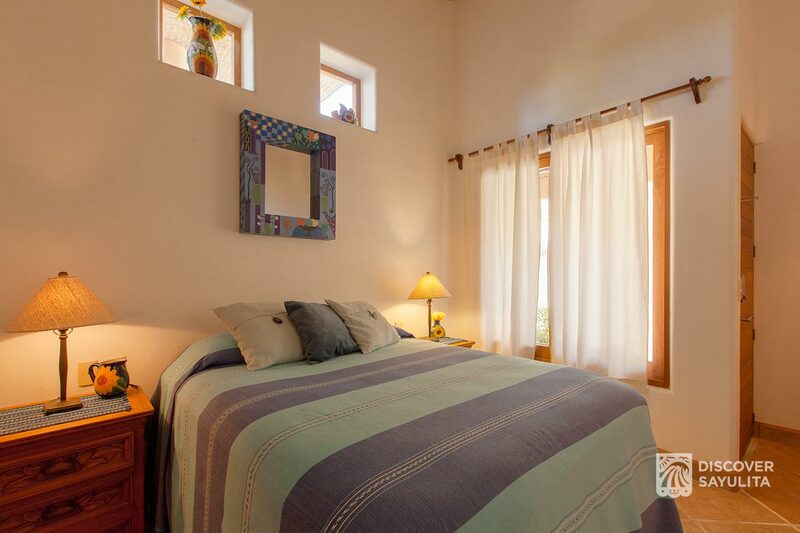 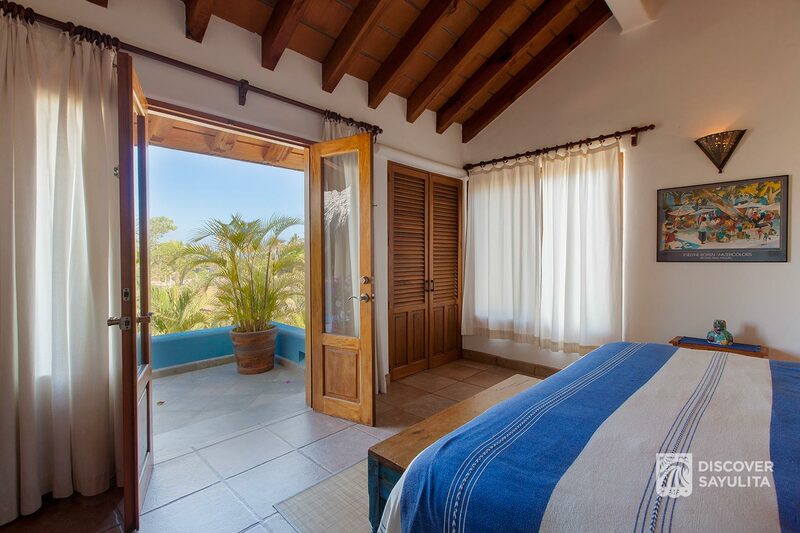 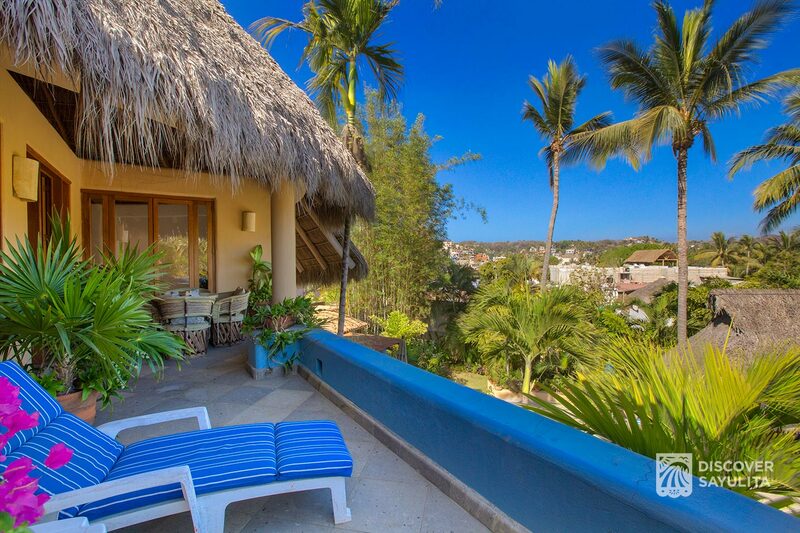 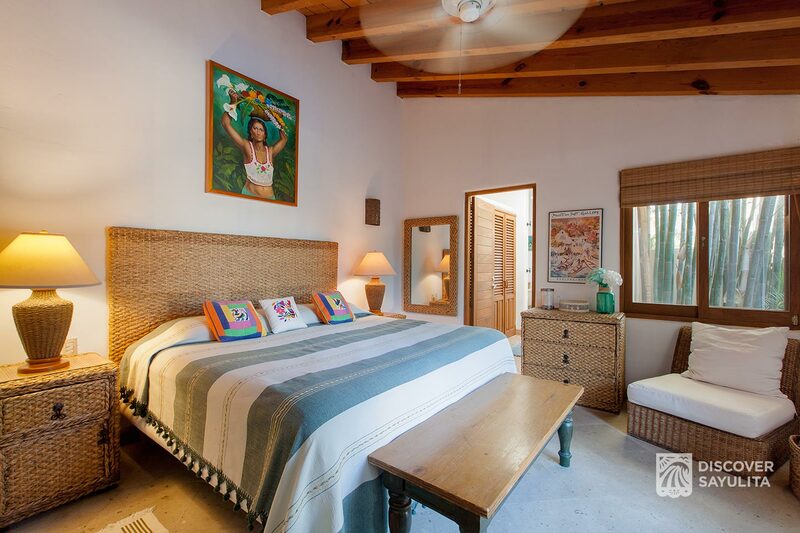 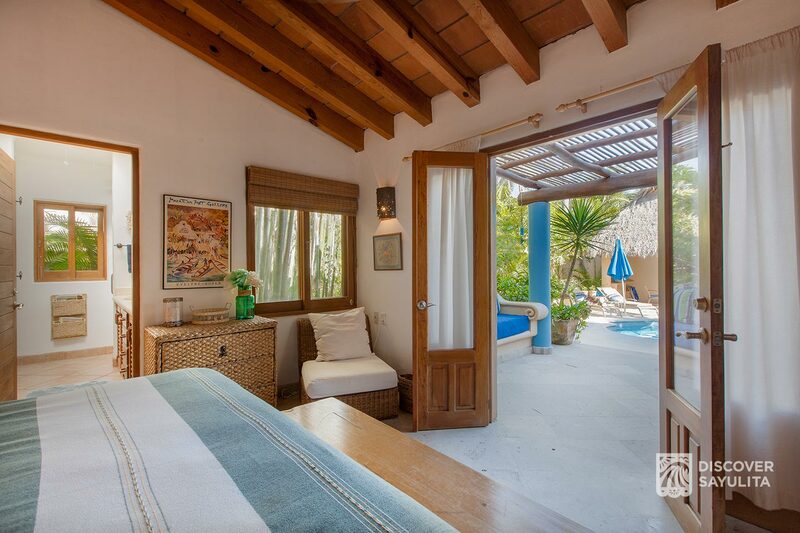 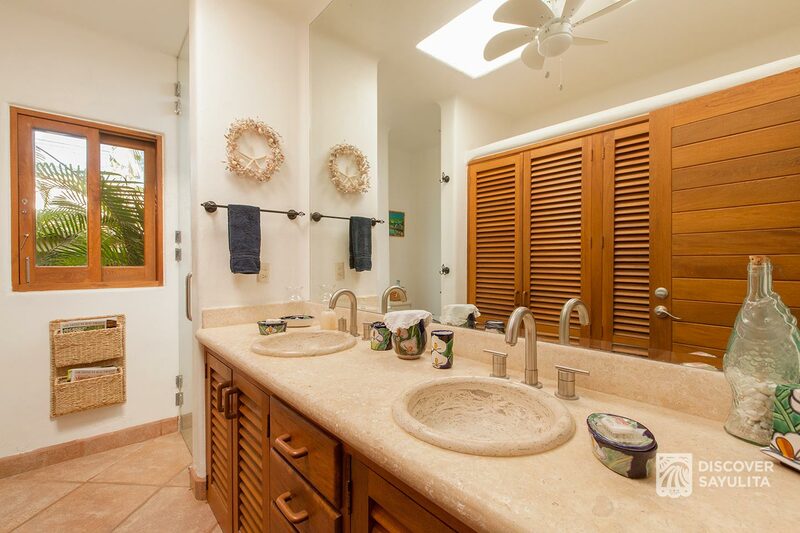 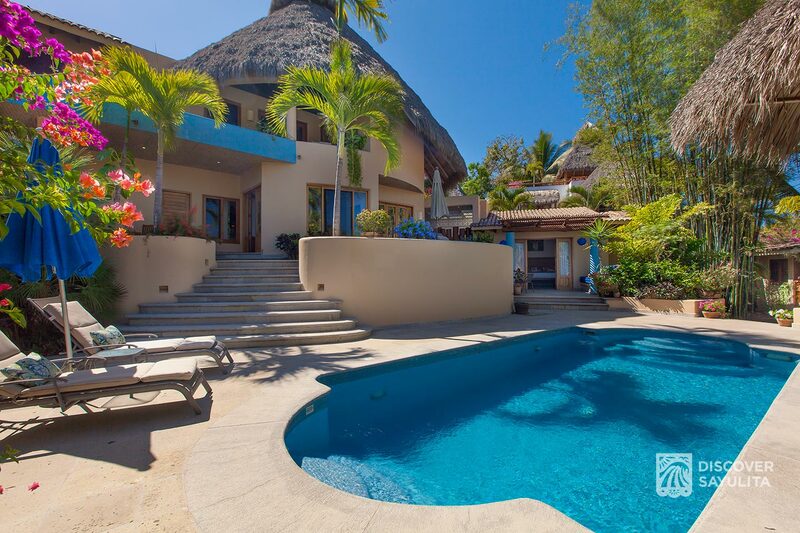 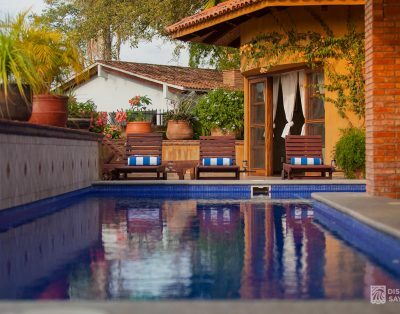 Casa Azul consists of 3 master suites, each with their own bathrooms and air conditioning. 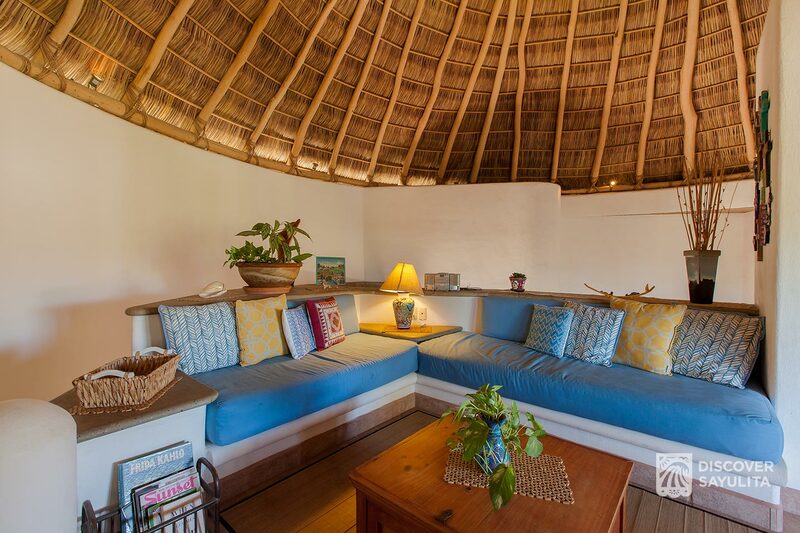 There is a bonus room which can sleep 2 extra children or be used as a large sitting area. 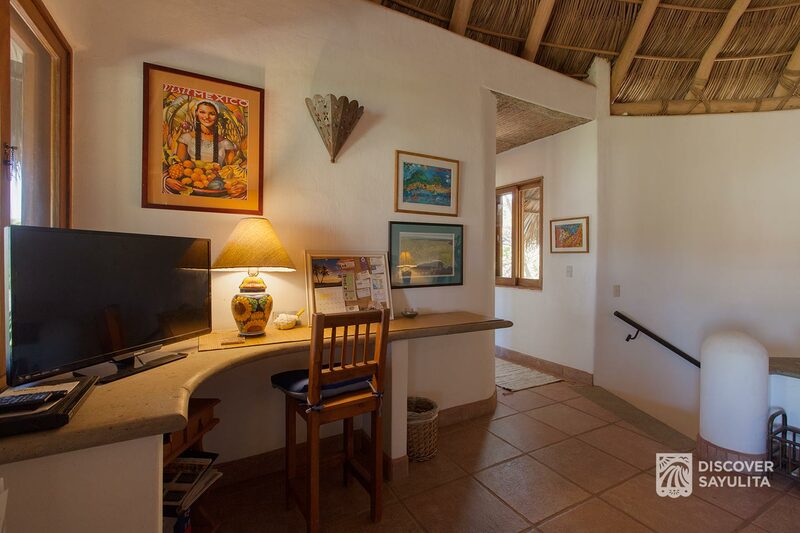 It also has a desk area with if you need to catch up on some work while on vacation. 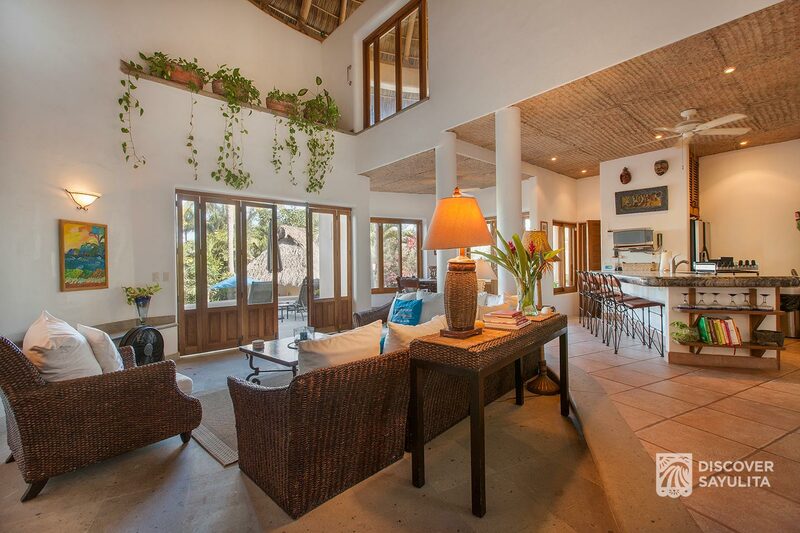 Wifi is available throughout the villa to keep you connected back home. 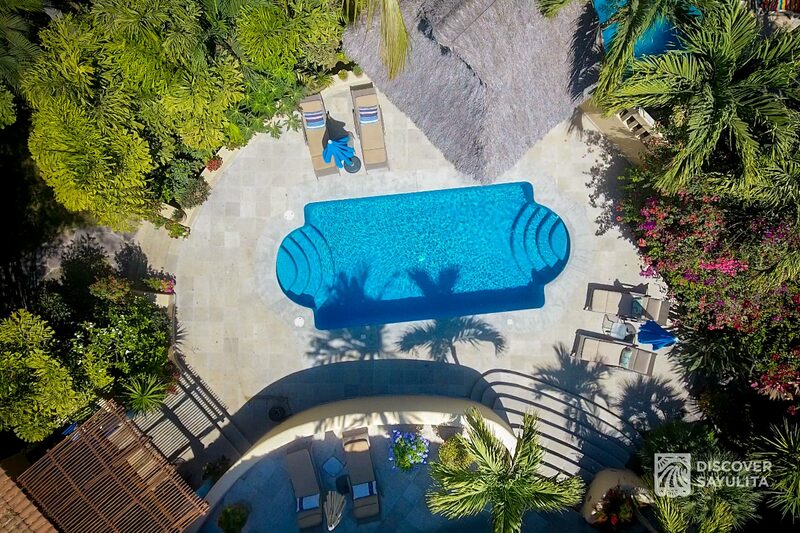 Set in a private, landscaped yard, this environmentally friendly, chemical free, saltwater pool is the refreshing spot to cool off after a long day of shopping and exploring. 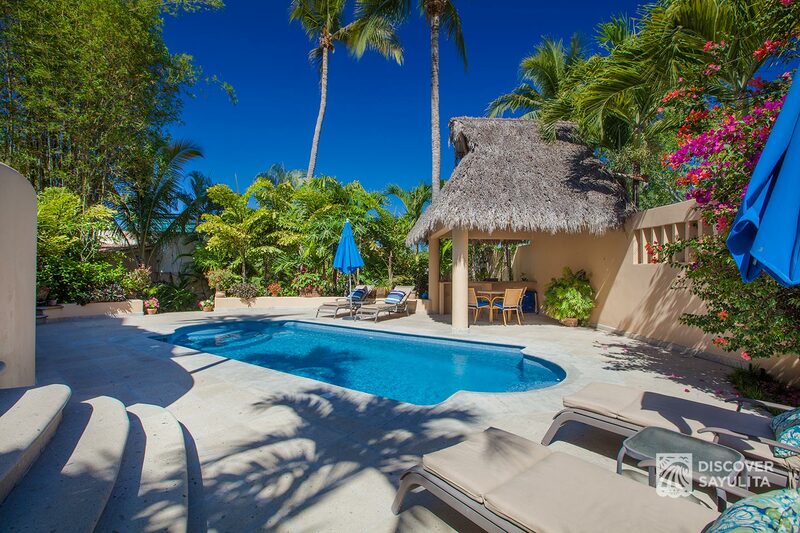 Located next to the wade in pool, the palapa covered seating area is a great place to have a drink and conversation. 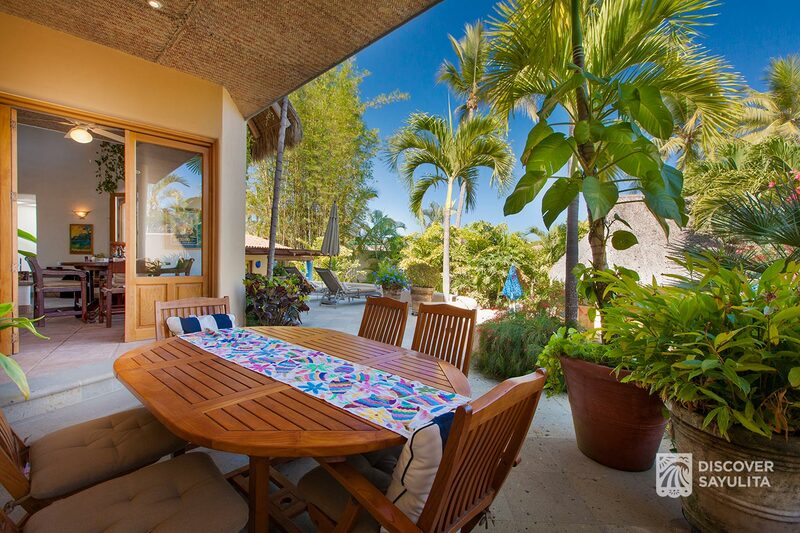 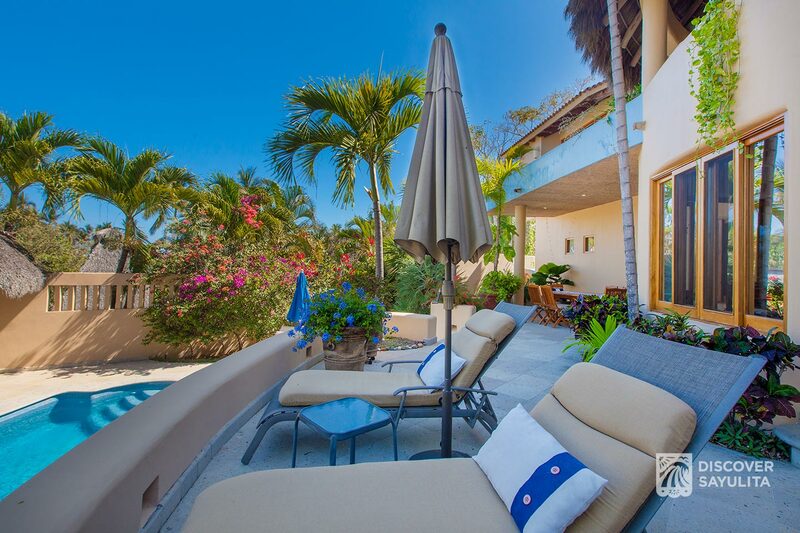 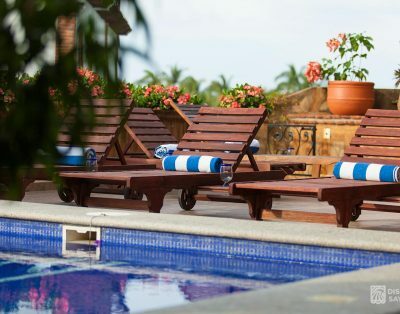 Casa Azul includes ample outdoor, umbrella covered deck chairs, and beach towels. 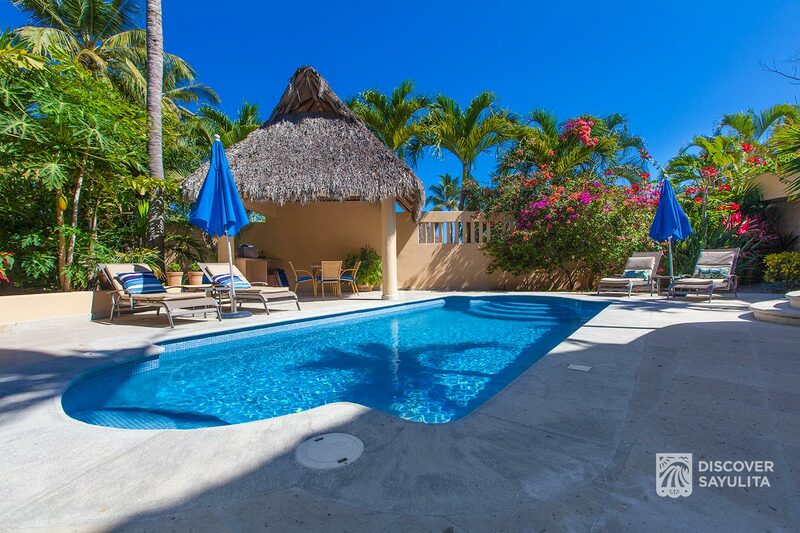 Casa Azul is a popular, northside regular booked villa. 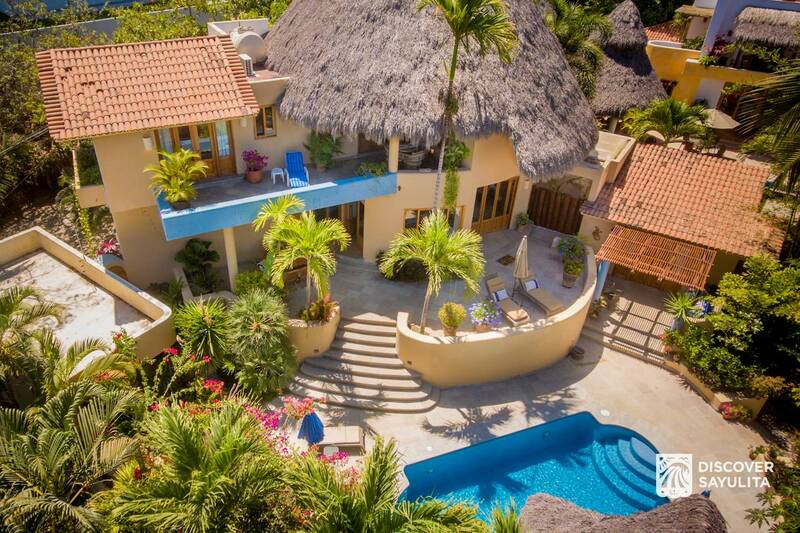 Don’t miss out, reach out today!